The first grade teacher in me knew I needed to buy the new Hey, Valentine set on my first flip through the new Occasions catalog. I make my class a valentine every year and this set is perfect for kids (and adults too). There are so many terrific new stamps and accessories in the new catalog that it was hard to decide - I have pre-ordered two times already! You can order from the catalog beginning January 6! Please let me know if you need a catalog. 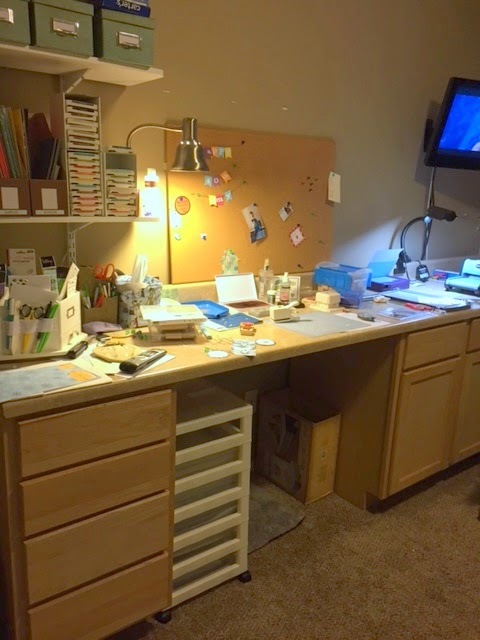 Several weeks ago I asked my newsletter readers to send me a picture of their crafting space for a project I was working on with Stampin' Up! 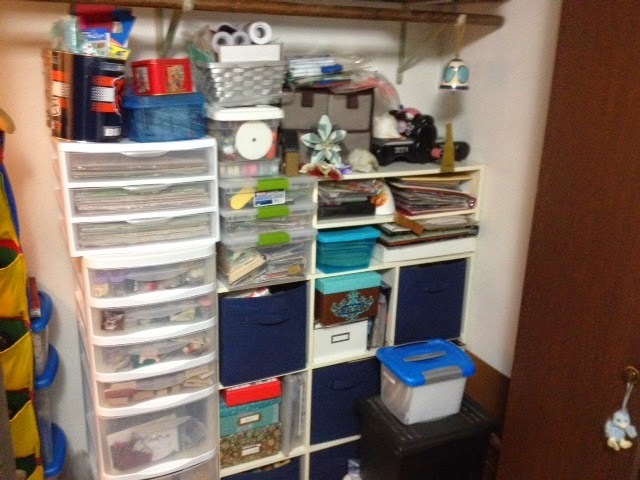 Today I am going to share Amy's, Whitney's, Mary's and Ruth's spaces with you all. 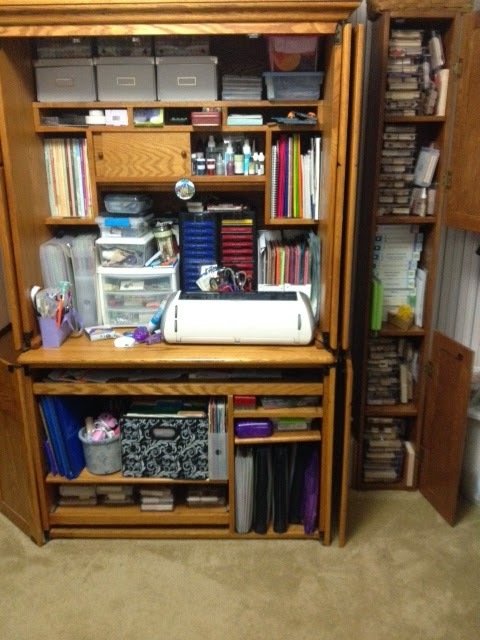 It's always fun to get a glimpse of the creative spaces where crafters work! If you'd like to see my space, click here. As a thank you for sending me their pictures, I put together a card kit featuring the new Sale-a-bration Best Year Ever Designer Series Paper and the buttons from the Best Year Ever Accessory Pack. All they have to do is add a greeting of their own and start assembling. Leave a comment on my Facebook Business Page or here on my blog between now and January 6 (when you can start ordering from the Occasions and Sale-a-bration catalogs), and I will put your name in a random drawing for one of these card kits. 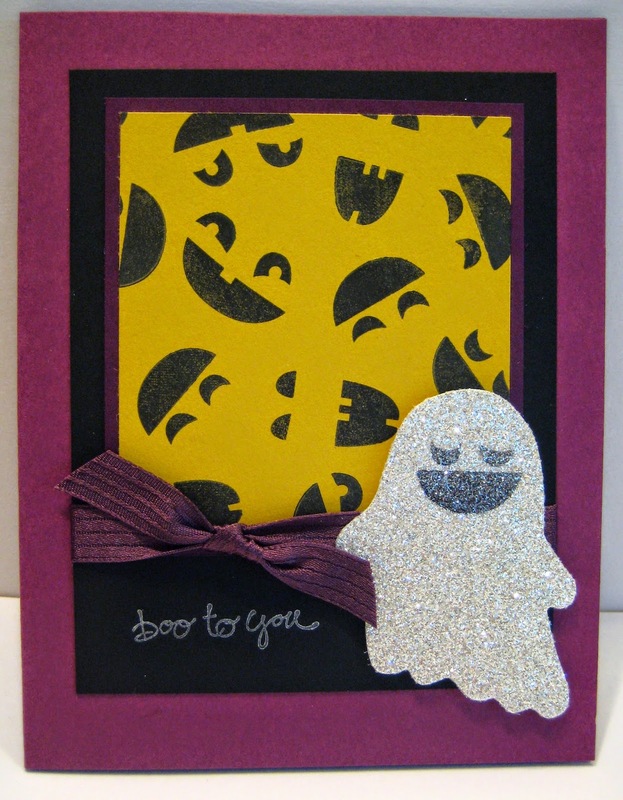 Then you can make six of these cards for yourself! I do love making Christmas cards, but when December 25th rolls around, I'm ready to put away the red and green and pull out my newest goodies. I pre-ordered from the Occasions and Sale-a-bration catalogs in December and had all sorts of fun new stamps and accessories waiting for me. I created these cards with the Sale-a-bration set, Big Day. While I was at it, I used Sale-a-bration DSP too. This paper is Best Year Ever and is one of the exclusive products you can choose for free from the Sale-a-bration catalog for every $50 you spend. If you haven't received your catalog yet, let me know. Find me on Facebook for occasional crafty updates! A few were inspired by or cased from a swap I did in September, and the rest were created by pulling out every Christmas stamp set I had and using one or more stamp from each set. Wonder how to make that snowflake? I used the Snowflake Card Thinlits Die and rotated the snowflake 90 degrees and ran it through a second time. Here are a couple more tags from our tags night. They were both popular. My stampers liked the brown one becuase it was simple. And who doesn't like a Santa tag? I try to do a version of a Santa tag every year, and this cute one is thanks to a fellow demo in my recent swap. We made 15 gift tags at my recent class, and organizing 15 little projects that often use some of the same products is always a bit challenging. But this year, I arranged "like" tags with each other in a box that we passed around. There were a few things that we still needed to share, but I think it worked out pretty well. Stay tuned for more sets of tags! I can't take credit for the tag idea in the bottom right. I was a part of a tag swap with some fellow demonstrators - thanks to my friend, Mary McNeely, for a great idea! This set is so versatile. I've been making cards with the snowman and polar bear all season, and now I am putting a more rustic spin on it with the Crumb Cake cardstock and Hardwood background stamp. What makes this card a fun one is that it is a seemingly normal card until you realized it is a Z fold. It went together quickly and my stampers seemed to like it. If it's too plain for you, add some rhinestones for a little extra bling! I had designed 2 of the 3 Christmas cards for the last round of Christmas Stamp-a-Stacks for 2014, and I was looking for something different for the last card. The Trim the Tree Designer Series Paper was just what I needed! I made about 6 different pinwheels and decided I had to stop! So I cut the papers for these 3 cards and then my stampers were able to mix and match the fronts and back to create these exact cards or create a pattern of their own - always fun to see what they come up with! Wondering how to make this card? Start by adhering two 2 5/8 x 2 5/8 inch squares. Lightly tack the first 1 1/4 x 1 1/4 inch square down. Layer the second patterned DSP on top of the first square and stick down with your normal amount of adhesive. Continue the pattern going around the base piece by placing the new piece on top each time. When you get to the last square, tuck it under your first piece. Then you may want to add a little more adhesive to the first square. To finish off the pinwheel, you may use a brad, button, rhinestone etc. to cover the point where each square meets in the center. 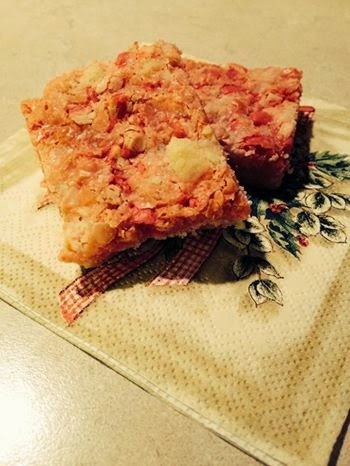 These Peppermint Crunch Bars are on my Pinterest Stamp-a-Stack Treat board if you'd like to try these goodies yourself. They were kind of an accident as I planned to make something else pepperminty but couldn't find it when I went back to find the recipe. These were quick, easy, tasty and fit the Christmas theme! By request, we made this Santa bow at my last stamp class. I've been seeing him on Pinterest since last year, and when one of my stampers asked if we could make it, I was happy to agree. I used directions from Amber but there are a few variations out there depending on your supplies. He looks great on one of our take out boxes or on a package, but we stuck him on a card front in class. I've been nominated to participate in a Creative Blog Hop by my friend, Mary Ellen Stites. She has a lovely blog at Create with M.E., and I enjoy following her paper crafting as well as getting an occasional peek at some of the other projects my very talented friend has been working on. Since most of us are in the thick of Christmas shopping, I thought my latest project would be perfect to share today. Each year as a part of a holiday themed class, we do a gift card holder. Here are some of my favorite past projects: Santa, pop-up, package card(most popular post), another Santa, pop-up box, Pop 'N Cuts, and a gift card tin. So this year, I wanted something unlike we'd ever done before. I had so much fun creating this card using White Christmas. It's got so many different stamps in the set that you can make this card for absolutely anyone. I went with the car to create my own little "Over the River and Through the Woods" scene. You can find the directions at Splitcoaststampers to this Surprise Pop Up Card that we turned into a gift card holder. I am putting the final touches on a Christmas Card Stamp-a-Stack that will be this Friday and Saturday. 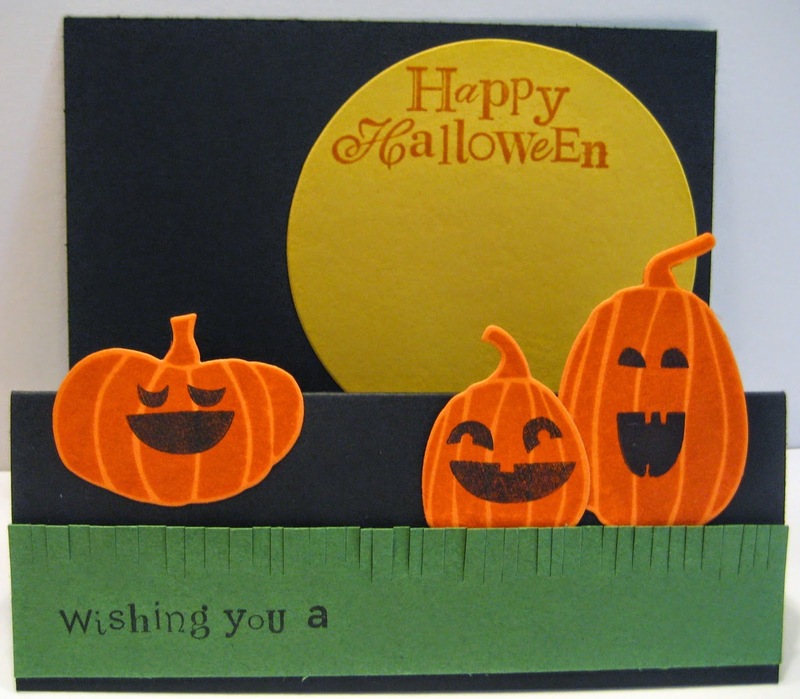 We do 3 cards and I am finishing up the 3rd card idea to allow myself time for cutting and prepping supplies. Hopefully while I am working, my mind will wander and I can be thinking about Christmas tags for a class next Tuesday. I am a fairly simple stamper. I like at add a button or ribbons from time to time, but I tend to keep my projects basic ink and paper. I own so much from the catalog, but I remember a time when I owned very little and wanted to be able to recreate the things I saw at a workshop. By keeping it simple, my customers can see how they can make these projects with the things they have at home. Since I was a kid, I loved papers and stationary. (I once traced a Ziggy off of a shirt with carbon paper to create my very own Ziggy stationary. I'm sure I was an inky mess when I was done, but I only remember the beautiful stationary :-) I create so that I can share my love with others either through the mail in the form of a handmade card or through the hands-on experience of creating their own. I hate to admit it, but my creative process is messy. I start with the stamp set, then get to work with colors and layout. You'll see several different inks and pieces of cardstock spread around my workspace as my ideas are coming together. If I can't create exactly what I'm looking for, I set it aside and come back to it later. Many times when I come back to it with fresh eyes, I find that I like it just the way it is or that a simple change will make it the card I was picturing in my mind. 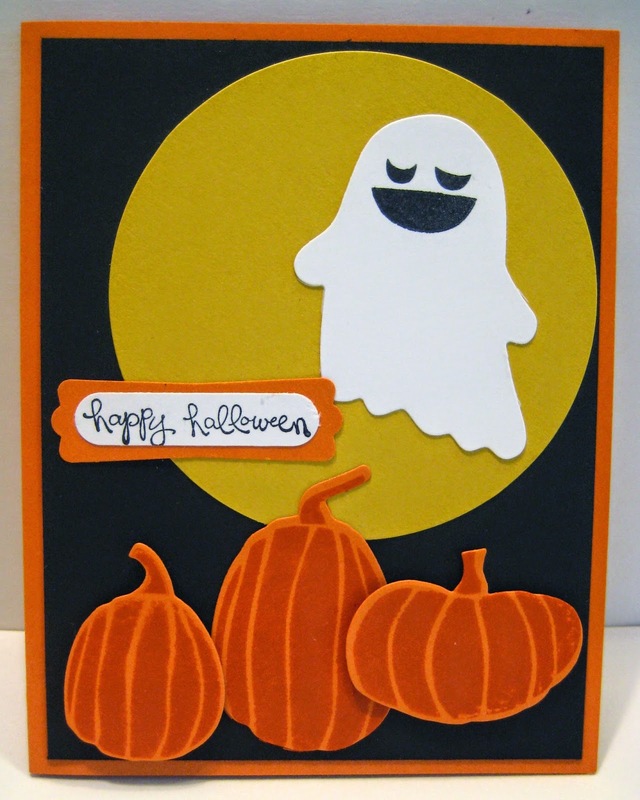 I am nominating Amanda over at The Craft Spa to continue this blog hop. Watch for her post next Monday, December 8. I first found her through a Pinterest pin, and I am so glad I did. She will take one stamp set and show so many different ways to use the same set or she will design one "wow" project and make several using different stamps. She makes it easy to imagine a project and to see the possibilities in a particular stamp set or project. Enjoy looking around her blog! Don't forget tomorrow is the last day for the Online Extravaganza. Visit my online store to shop now.